LACBA proudly announces a new collaboration with the Constitutional Rights Foundation to broaden the reach of the Dialogues program. This important program fosters conversation and debate focused on the preservation of American liberties and values. Volunteer lawyers and judges lead Dialogues sessions at high schools across Los Angeles County. The committee develops, promotes, and administers discussions in high school classrooms that educate on and critically examine the Constitutional civil liberties and values fundamental to the American system of government. Founded following the tragic events of September 11, 2001, and to honor Constitution Day, the materials are revised yearly in light of current events and issues. Dialogues are conducted by teams of volunteer lawyers and judges. “Participating in the Dialogues on Freedom program is an honor for our Court and our judicial officers. Understanding the Constitution, its amendments and its impact on our daily lives and freedoms will assist our community, our judicial system, and our future generations to fully appreciate these rights and responsibilities.” – Los Angeles Superior Court Presiding Judge Kevin C. Brazile." Commemorating the tragedy of September 11, 2001, the need to inspire and educate our young people about the law and constitutional freedoms has never been greater. The program reached 50 classrooms in 19 schools throughout Los Angeles County, and is a true collaboration with the courts. "Our Court and judges are honored to participate in the Dialogues on Freedom program. Our judicial system, and our community, directly benefit when all citizens, but especially young adults, better understand and appreciate the impact of the Constitution on our daily lives and freedoms.” - Los Angeles Superior Court Presiding Judge 2017-18, Daniel J. Buckley." 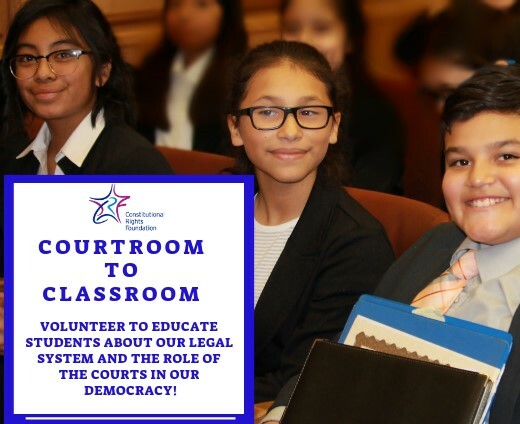 On March 14 and 15, 2019, over 140 volunteer judges, attorneys and law students led a record 3,600 high school students in classroom debates about freedom, civil liberties and the American system of government as part of the Dialogues on Freedom, in collaboration with the Constitutional Rights Foundation (CRF),the Los Angeles Superior Court and Los Angeles Unified School District. Founded in 2002 by U.S. Supreme Court Justice Anthony Kennedy in response to the 9/11 terrorist attacks, Dialogues on Freedom was created to provide students with an opportunity to explore the concepts of freedom, law and justice by exploring scenarios that students might experience at school, at home or in their neighborhoods. For many of these students, it was the first time they were able to interact with judges and attorneys in a casual atmosphere. This was the 18th year for LACBA’s Dialogues on Freedom program, and the second year in partnership with CRF, with attorneys, judges and law students fostering lively classroom debates on free speech, the right to privacy, dress codes and social media topics that are interesting and relevant in students’ daily lives. There are no wrong or right answers. Students have an opportunity to share their opinions with each other as to whether teachers, principals, city officials or police have the right and/or obligation to intervene in situations students view as an infringement on their personal freedom. Do school officials have the right to restrict students from kneeling, sitting or conducting any other form of political protest during the National Anthem? Should a student be arrested for selling prescription drugs based on a confession he made to a teacher which was overheard by a deputy sheriff? Did school officials have the right to alert police to an after prom party at a local hotel where students were arrested for underage drinking? Should students be required to download a “Student Attendance App” that allows school staff to track the location of students on and off campus? Should a student have been suspended for yelling what some would call a “slur” during a Glee Club performance, but what he claims is a saying all the kids use when a performance is poor? What: Courtroom to Classroom brings judges and attorneys to a local classroom to deliver a PowerPoint on the Constitution and lead students through a moot court activity on a real Supreme Court case. Where: High school and middle school classrooms throughout Los Angeles County. When: One class period, whenever you and the school are available. How: Register here to volunteer at a school near you!